Chocolate lovers, don’t you hate it when you reach for what looks like an all-chocolate cupcake only to find that it’s yellow cake disguised by chocolate frosting? These moist, rich cupcakes are made with store-bought devil’s food cake mix. The secret to these deeply chocolaty vegan cupcakes: avocado and coconut oil in place of butter. These cupcakes are frosted with a chunky mix of peanuts, chocolate chips and marshmallows. German chocolate cake, while flavored with coconut, is usually made with all-purpose wheat flour. In this gluten-free twist, coconut flour and eggs are combined to create dense, delicious desserts. 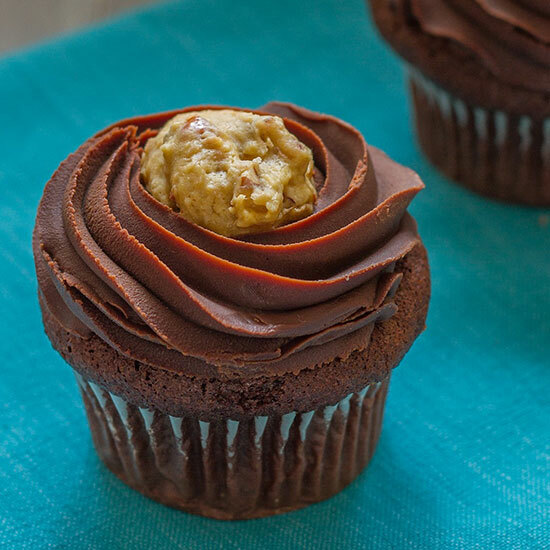 These peanut-butter-filled cupcakes are double-dipped in a silky chocolate ganache. This wonderfully rich cocoa crème fraîche batter makes for incredibly decadent cupcakes.